Ever since I met this sweet slow cooker breakfast casserole, I’ve been hosting weekend brunch as often as possible. It’s a treat to be sure, loaded with tender cubes of custard-soaked brioche tinged with the warm scent of pumpkin spice and topped with a nutty brown sugar streusel. You’ll want to keep this one in rotation all year long. 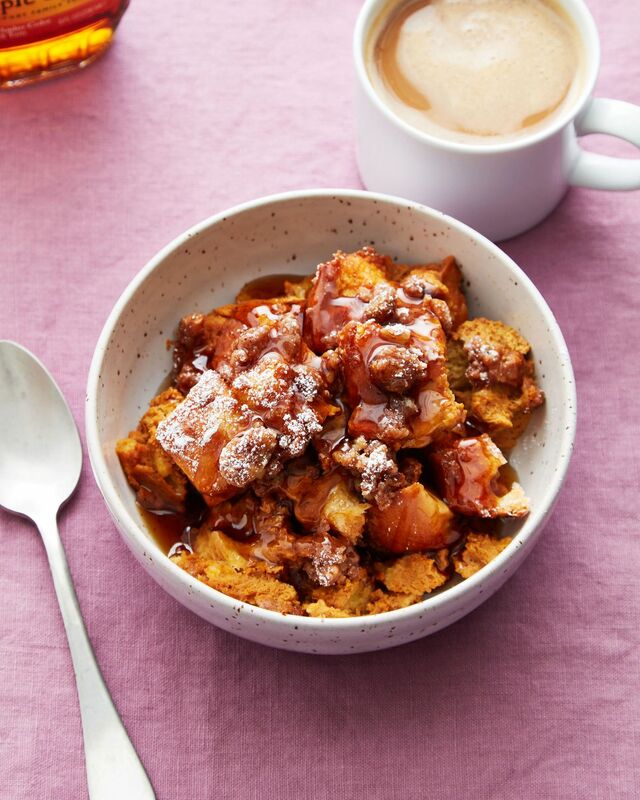 French toast casseroles are my easy go-to solution for serving this breakfast favorite to a crowd. There are oven-baked options that call for well under an hour of cook time, but more often than not I find the slow cooker to be a better choice. For starters, leaning on the slow cooker frees up the oven for other important tasks, like cooking up a big batch of crispy bacon. More importantly, it's the ideal option when hosting guests for the weekend since it stays warm all morning and can therefore please early risers and late sleepers alike. The best thing you can do for your slow cooker french toast is to toast the cubes of bread. It makes a big difference in the way breakfast cooks up, and it prevents the casserole from getting too soggy. It's absolutely worth the extra step, and it can be done well in advance so you don't have to add on time that morning. Arrange a rack in the middle of the oven and heat to 250 F.
Place the bread in a single layer on a rimmed baking sheet and toast, stirring halfway through, for 20 minutes. Set aside to cool slightly. Generously coat a 6-quart or larger slow cooker with cooking spray or butter. Arrange the toasted bread evenly in the slow cooker and set aside. Place the eggs in a large bowl, and whisk to combine. Add the half-and-half, pumpkin, sugar, pumpkin pie spice, vanilla and salt, and whisk to combine. Pour the custard over the bread. Use a wooden spoon to gently stir so all the cubes are evenly coated and soaked through. Cover and refrigerate overnight, if desired. If necessary, remove the uncooked casserole from the refrigerator and let it sit at room temperature while you make the crumb topping. Stir the flour, sugar, pecans, cinnamon, nutmeg and salt together in a medium bowl. Drizzle with the butter, and stir until big, slightly floury crumbs form. Sprinkle the crumb topping evenly over the casserole. Place a large sheet of paper towels over the slow cooker, making sure it completely covers the top of the slow cooker but does not sag down onto the casserole. Cover and cook until set, 4 hours on the low setting or 2 hours on the high setting. Right before serving, dust with powdered sugar if desired. Serve warm with maple syrup if desired. Recipe notes: The bread can be toasted up to several days in advance and stored in an airtight container at room temperature, once completely cooled. The casserole can be assembled up to one day in advance, covered and stored in the refrigerator until ready to slow cook. Leftovers can be stored in an airtight container in the refrigerator for up to three days.